This production of the 1980 opera, initiated at the English National Opera in 2007 and subsequently brought to the Metropolitan Opera in New York, is brilliantly inventive in its staging. With Glass’s intoxicating music rendered beautifully by vocalists and orchestra, the combined effect is penetrating and moving. 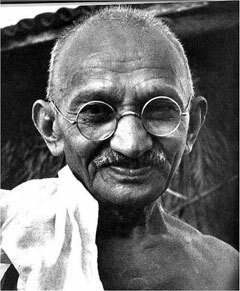 Gandhi’s approach to nonviolent resistance took shape during the twenty-one years (1893-1914) he spent in South Africa. There, he gradually took on the philosophy, demeanor and dress that we come to associate with him and with his later years of protest in India. 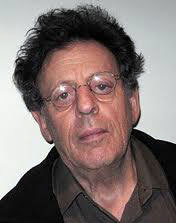 Philip Glass’s opera, inspired by Gandhi’s development during this time, only loosely describes a sequence of events. Instead, the allusion to this history is paired with a coordinated narrative that evokes the less structured but powerful poetry which the opera brings forth. This secondary narrative includes three major sections entitled Tolstoy, Tagore and King. During each section, a silent actor representing one of these seminal figures – Leo Tolstoy (1828 – 1910), the Indian poet and Gandhi’s close associate Rabindranath Tagore (1861-1941), and Martin Luther King (1929-1968) – is featured in a perch onstage. Emblematic rather than active, they do not contribute directly to the action, but, by their quiet presence, inspire it. The text of the opera is taken from The Bhagavad Gita, the section of the Indian epic The Mahabharata that contains dialogues between the god Krishna and the warrior Arjuna in which Krishna encourages Arjuna in the fight for righteousness. The text of the original, and the libretto of the entire opera, is in Sanskrit. 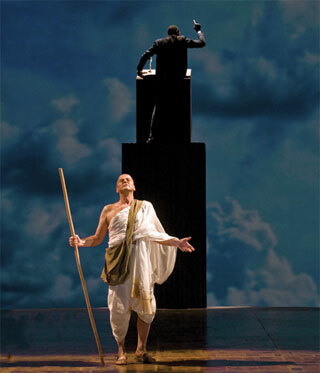 The libretto of Satyagraha is taken from The Bhagavad Gita, the Indian classic written (and here sung) in Sankskrit. Though the opera has virtually no concrete narrative or descriptive libretto, miraculously, the four hours of this production is absolutely riveting. I first saw this production several seasons ago live at the Metropolitan Opera and, at that time, was transfixed; I found the music hypnotic and the staging amazingly inventive. This Live in HD viewing was, despite its one electronic step away from the theater, just as captivating – so much, in fact, that I plan to go to the Live in HD encore broadcast. How does this production of minimalist music, with very little dramatic support, manage to entrance an audience for four hours? The subtle chemistry between the droning but not monotonous music, the rhythmically elongated but highly inventive staging, and the spirit evoked by the singers supplies this somewhat unexpected result. The staging involves a variety of thematic improvisations that evolve throughout the performance. These effects are produced largely by a troupe of a dozen or so members of the onstage so-called skills ensemble. During the intermission interview, the designers indicated that early on in their conceptual process, Gandhi’s South African newspaper, Indian Opinion, became a focal theme. And it turns out there is a lot of newspaper onstage. 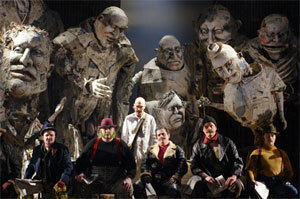 There are also lots of large-size puppets manipulated by members of the skills ensemble, some of whom are on stilts. 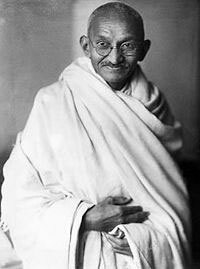 Satyagraha is the term coined by Gandhi to designate his philosophy of nonviolent resistance. In Sanskrit, it literally means truth force. Perhaps the most dramatic of the staging effects involves members of the skills ensemble slowly and deliberately unwinding many rolls of scotch tape across the stage, creating a temporary, hovering avenue of lines. In the end, a birdlike character, hoisted high above, methodically pulls together, folds up and transports away the many yards of tape. Richard Croft, as Gandhi, was really wonderful. His clear tenor was a joy to listen to and his conveyance of the character of Gandhi was compelling. The other soloists were also very good, as was the chorus. This is not easy music to sing. It is relentlessly homogeneous through each of its individual sections – though it does vary subtly and compellingly – and following it without getting lost is, I imagine, very difficult. The orchestra played very well under conductor Dante Anzolini’s baton. At the outset, I felt that the music trudged along a bit and did not have the energy I remembered it having when I was at the live production several years ago. However, the verve and energy did pick up; I later sensed that the somewhat deliberate tempo early on was the maestro’s intentional preamble to the later, more energetic, pace.